GORKHA, Sept 12: When the 7.8 magnitude earthquake hit the country on 25 April of 2015, fourteen districts were the most affected. At its epicenter was Gorkha, where cracks were visible even on land. Though there was a loud hue and cry for help, the government could not address the problems of the quake victims on time. They lived in temporary shelter for over a year as initiatives failed to take off to rebuild their quake-damaged houses. 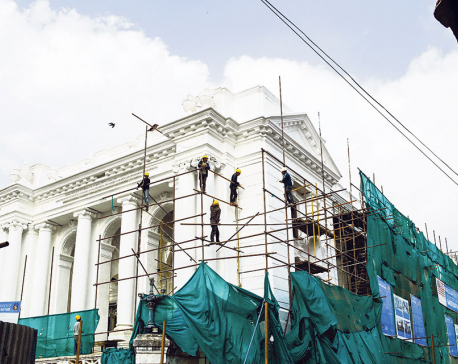 Even after the National Reconstruction Authority started delivering service, it has been snail paced. Quake victims have time and again raised voice against the lethargic process. For instance, they had to wait for months to get second installment of the house grant and even now only a very few have received the third installment of the grant. As part of the process, the victims are required to produce certified construction report of their house and in the event they fail to do so they become ineligible for receiving the remaining grant installment(s). Apart from that if they do not complete the construction according to the time table, the quality of the construction is affected and which in turn can hinder them from qualifying for the grant, let aside the hassles they have to go through to complete the construction on their own. In addition to the financial woes, victims have been also suffering from shortage of raw materials required to construct houses. In lack of construction materials like sand, bricks, stones and even timber in the district, victims lament that their efforts to construct the house on time has been greatly affected. “It has been months since I am looking for sand and aggregate to construct the roof of my house. 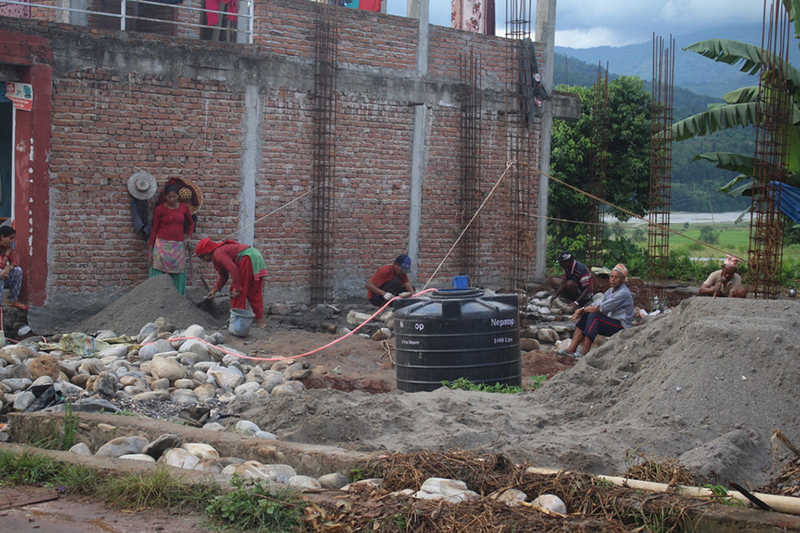 Though other construction materials are also scarce here, finding sand and aggregate is a nightmare,” said Lekhnath Pandit of Bhimsen Rural Municipality. “In lack of that, construction of my house has been come to halt though we don't have a house to live in,” he added. He had started building house four months ago. By now, he would have almost completed it if things had gone smooth. His neighbor Bal Krishna Lamichhane has another problem. “Though I was able to get the raw materials for constructing the roof, I have been I am unable to get raw materials for plastering the walls,” he said. “Because of that I have been unable to give finishing touches to my house,” he added. Since the last 10 days, Lamichhane has been making rounds to procure the raw materials. Sometimes to Arukhat and sometimes to riverbanks, he has been trying to find dealer who would provide the necessary raw materials. “I reached as far as Arughat to procure the necessary raw materials, but so far I have remained unsuccessful,” he said. One of the major reasons for which the victims are panicking is the deadline set by the government to complete the construction of the house. Recipients of the first grant are supposed to complete the construction of their homes by the end of this fiscal year. “On one hand, we are not able to acquire construction materials and on the other hand, we are in pressure to complete it on time. How can we do that?” Pandit laments. “Who would like to delay construction of his own house by his own will?” he questioned. In total, the quake victims are getting Rs 300,000 as house grant. However, those who fail to keep pace with the government's timeline are unlikely to get full installments. Construction of house is going on in full swing in Gorkha and other districts as the work has to complete by the end of this fiscal year. “There is sand near the house. But we are not allowed to collect sand from there. If we want to buy, it is not available. What is the intention of the government? What does it want to do by just restricting our abilities?” asked Lamichhane. Locals are not allowed to collect sand and aggregate from river banks unless authorized by the local governing body. However, as the District Coordination Committee is yet to decide taxation on use of sand and aggregate from rivers, locals are forced to wait. Meanwhile, Local Development Officer of the district, Narayan Acharya, stated that a study is underway to study the available resources and how much of it can be opened for the locals. He asserted that the scarcity of construction materials is because of massive scale on which the construction work is underway. “Actually the district has the required construction materials but because everyone is expediting the construction process concurrently to meet the construction deadline, supply of the raw materials has been not able to meet the demand,” he noted. But we are trying to find an alternative to meet the demand, he said.